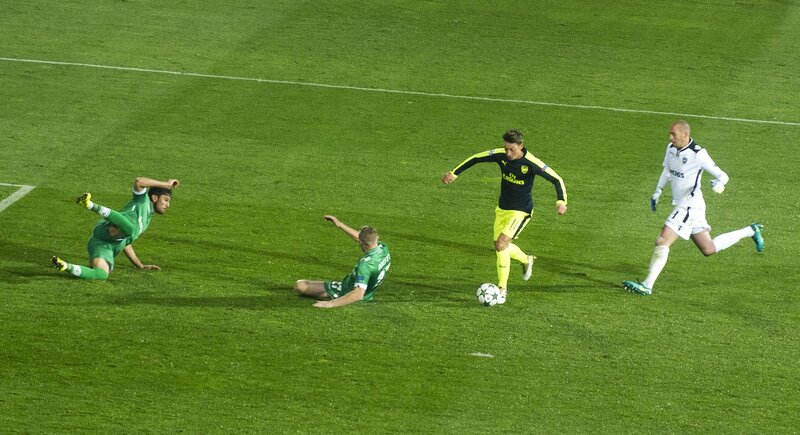 Yesterday, I hummed about my remix edition of MJ’s Liberian Girl – “Bulgarian Night” – but never knew Arsenal would wait till the 89th minute to grab the winner over Ludogorets. The regular 7:45pm kickoff (local) was shifted yo 8:45pm no thanks to Daylight Savings. The Gunners needed daylight saving after going down 2-0 within the 1st 15mins. Ospina was line-rooted for the 1st goal as Cafu guided home a Ludogorets free kick in the 12th minute. 3 minutes later, Cafu got better of Gibbs before squaring to Keseru to send the stadium to Ecstasy. It was a poor start for the North Londoners. Ozil got his 200th career assist when Xhaka started the comeback in the 20th minute. The Gunners kept knocking and were rewarded in the 42nd minute. Ramsey made his 1st appearance count in this season’s competition when his weighted cross was guided home by Olivier Giroud making his return since he was sent off in Paris. It was his 3rd goal in 2 games. The second half was more pedestrian than the 1st. Ospina was called up a couple of times and he was found worthy. The Gunners’ attack were continually foiled and the game was heading to a stalement. Off came Ramsey and Xhaka, in came Chamberlain and El Neny. Then came the magnificent moment. Olivier Giroud won a tackle in Arsenal’s half, El Neny took no time in unleashing a sumptuous through pass to Ozil who was left with an onrushing goalkeeper. The German measured the height of the goal on the edge of the box, took thr daylight savings out of two Ludogorets defenders before slotting home for the winner. It was out of this world. Ozil is scoring for fun and all four of his Champions League goal this season have been against the Bulgarians. Iwobi came in for Sanchez but the victory was secured. In Basel, PSG grabbed a late 2-1 win after the home side were reduced to 10 men. PSG and Arsenal are through to the last 16 but top spot will be up for grabs at the Emirates on Matchday 5 when PSG come visiting. At the Etihad, Manchester City were 3-1 winners over Barcelona. It was a spirited display from the Citizens and a beautiful game to watch. End to end stuff. Time to watch Ozil’s goal again.